Image Analyzer 1.27 free download. Image Analyzer is a useful image editing, enhancement and analysis application that supports JPEG 2, BMP, CUR, ICO, WMF, EMF, PNG, JPEG and PCX for read/write and RAS, PNM, PGM, PPM, HIPS for reading. Image Analyzer allows you to resize and crop your images, apply filters and perform advanced conversions and transformations (Color model conversion, Distance, Fourier...). The program also offers automatic color correction, red-eye removal and an option to create user specified filters in spatial and frequency domain. SmartMorph is developed as a fast, advanced morphing application. 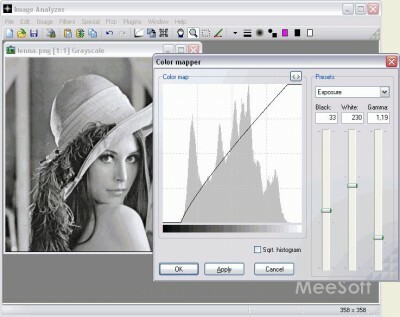 PC Image Editor is a free graphics editor that has many features of a professional product. AnimationXe is a many-sided and helpful application with the purpose of managing image files. DIMIN Image Viewer n5 is a free and useful image utility that lets you to view images in countless formats, and apply a variety of effects with this powerful , small and fast application. Image: Fix and Enhance is an application that helps you edit and convert graphic files and photos.